Producing a series of social documentaries that examine the local effects of the Civil Rights movement is among the key goals of a new partnership between the Tubman Museum and Middle Georgia State University. Through the partnership, formalized at a signing ceremony on September 1, Middle Georgia State will work to establish a digital imagery and documentary film center with the Tubman, the largest museum in the Southeast dedicated to educating people about the art, history and culture of African Americans. Plans call to establish the center in three phases: 1) developing a studio space and workshop for producing and teaching digital imagery and documentary film; 2) placing an artist-in-residence at the center with space to produce, curate and teach digital imagery and/or documentary film; and 3) developing the studio space into a more complete digital film production facility. Dr. Ron Williams, who is overseeing the university's participation as dean of the College of Arts and Sciences, said, "This partnership is going to provide valuable opportunities for Middle Georgia State students to be involved in real-world projects that benefit the community. It's a wonderful example of win-win." The Middle Georgia State University Foundation has already received a $15,000 grant from the E. J. Grassman Trust to help buy cameras and other equipment for the programs launched through the partnership. More grants are being sought. Plans call for Middle Georgia State to teach university level courses in film production at the Tubman center. The first project year will culminate with the submission of a Civil Rights documentary to the Macon Film Festival, as well as a formal showing at the Tubman. Tubman and university representatives will author a 10-year plan on how the center will help foster lifelong learning in the digital arts and how it will benefit the film industry in Middle Georgia. Another focus of the partnership is educational outreach to underserved youth in the Bibb County school system. Middle Georgia State's School of Education proposes to continue the J.O. Killens Literary Workshop partnership created with the Tubman and Bibb County Title I elementary schools. With the new resources available at the Tubman through the partnership, the School of Education proposes to establish a community engagement collaborative. Components would include Tubman classrooms being used as community-accessible space for delivering standards-based STEAM activities to parents and families; conducting workshops for teachers; and teaching video and audio recording techniques to teachers-in-training to help with classroom performance assessments. Longer-term goals of the partnership include developing a full-fledged digital film production facility as part of the Georgia Film Academy, a state initiative involving the University System of Georgia and the Technical College System. A proposed sound stage at the Tubman would be used to train student interns in the use of cameras, sound and editing tools. The sound stage would be made available to outside filmmakers. This fall, Middle Georgia State further tied into the University System’s participation the Georgia Film Academy by rolling out a new certificate program in film production. The certificate program builds upon the university’s already successful bachelor’s degree in New Media and Communications. 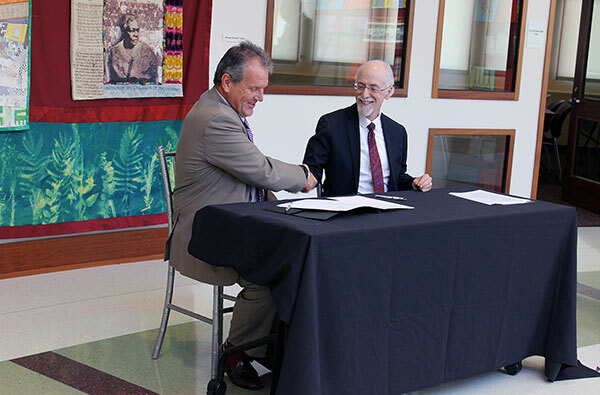 Photo: Dr. Christopher Blake, left, MGA president, and Dr. Andy Ambrose, Tubman director, sign the partnership agreement.